While many owners say their Shelties hate water, it turns out that with training and encouragement, Shelties can take to it like ducks. If you want your furball to become a true water Sheltie, you need to gently encourage lots of positive swimming experiences early on. 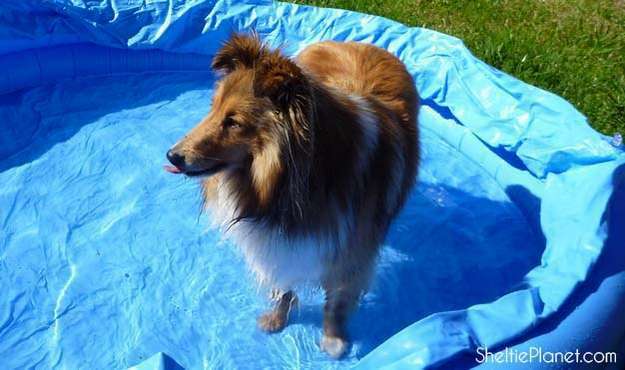 Many Shetland Sheepdog owners would agree that Shelties hate water. However, this isn't always the case. In fact, some Shelties love water. They can be encouraged to take a cooling dip on a hot summer's day, or get gentle exercise that doesn't put excessive strain on the joints. Teaching your Sheltie to swim is well worthwhile. Like many dog behaviors, your Sheltie's attitude to water is determined by her genes (eg, in her natural confidence or risk aversion) and the environment she grows up in (eg, frequent exposure to water). 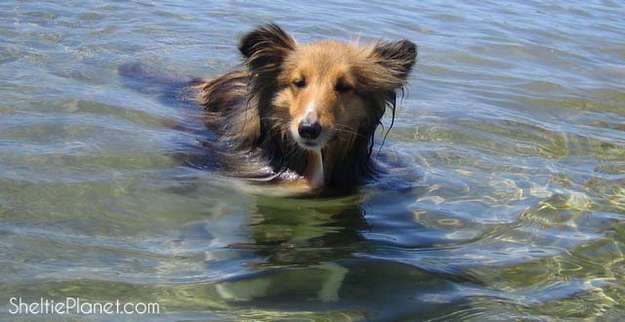 At first, the ocean, rivers and lakes can be strange and scary to a small Shetland Sheepdog. So to overcome this instinctive fear, familiarize her with water when she's still young. Just like socializing a puppy, if you want your Sheltie to become a true water dog, you need to do this when they're still young. Why should you encourage your Sheltie to like water? For a start, swimming is an excellent way to keep your Shetland Sheepdog fit, especially if she gets lazy or overweight and resists running. But it's also a great positive experience to give her as a puppy so she doesn't have the stress of fearing water her whole life. 1. Initiation - When Howard was a puppy, we took him to a sandy estuary when the tide was out. This left huge empty sand beds with little rivers running between them. It was fairly non-threatening and as we walked across the estuary, and Howard had to be brave enough to walk through the puddles that came to the top of his legs. 2. Confidence Building - Next we took Howard to a safe swimming beach where there were barely any waves - and started walking out to sea. At first, Howard whimpered and tried to call us back. But after a minute he plucked up the courage to follow us. Dogs are driven to follow their pack pretty much anywhere to avoid being left behind. We made sure that at no point he was under an excessive amount of stress (if your Sheltie starts to really panic, you need to slow down the desensitization process). 3. Go Deep - Finally, when the water was just below Howard's chin and he couldn't walk any further, we lifted him up a few inches. Instinctively, he began to paddle his paws in the air. We lowered him back into the water and off he went swimming of his own accord. It was an amazing sight. Who knew our Sheltie had a built-in instinct to doggy paddle? 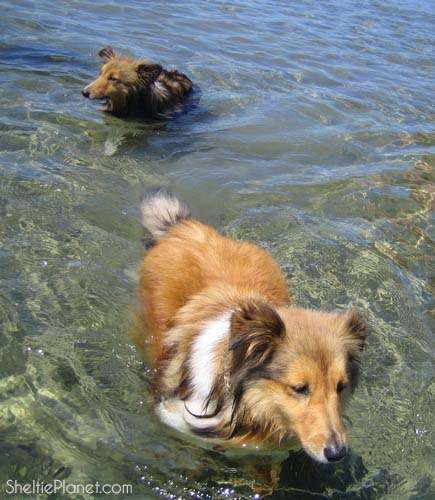 Some Shelties may never bound courageously into the ocean like a Labrador, but give her a fighting chance by teaching her to swim from 4-6 months. Of course, there are safety issues to consider. Small or weak Shelties may risk getting dragged down by the weight of their coat, so make sure you supervise all of your Sheltie's water adventures. Have a handy Sheltie lifeguard on standby. Our other Sheltie, Piper, had not been exposed to many things when we discovered at 9 months old. Water was one of them. But if Piper is anything to go by, teaching adult Shelties to swim is not much different to teaching puppies to swim. It's all about gradual, positive exposure, although you can expect a longer process. The first time Piper went for a swim was a complete accident. We took the dogs down to a local park with a river. We walked out onto the little wharf and before we could stop him, Howard boldly jumped straight in and became fully submerged. I was just about ready to push Pete in to save him when I realized Howard was quite happily paddling around in little circles like a wet fish. Then Piper decided it was his turn. Totally out of character, he courageously plopped off the wharf and into the river next to Howard. Man, did we laugh. It was a complete shock but also delightful to see Piper's paddling instinct kick in. We fell into stitches watching our two Shelties, freshly bathed the day before, paddling around in tiny circles with their little faces poking above the water in concentration. After that grand start, Piper followed his own desensitization program - by cautiously testing the water and flapping his paw around in it, before deciding it's time to swim. Totally adorable.